The Lebanese have an impressive amount of recipes featuring delicious spices, wonderful flavours and fresh ingredients. Lebanese cuisines are definitely foods your taste buds need to explore. Jumia Food shares 4 mouth-watering lebanese dishes to try. This Levantine Arab dish is made of burgul (crushed wheat) or rice and chopped meat. It is popular in Lebanon, Syria, the Palestinian territories, Jordan, Iraq, Turkey, Iran, Cyprus, Egypt, the Arabian Peninsula, Armenia, Israel and several Latin American nations which received part of the Syrian and Lebanese diaspora in the early 20th century. 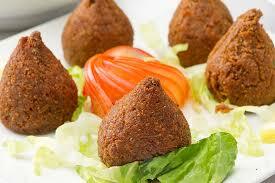 Kibbeh is a ‘torpedo-shaped’ fried croquette that is stuffed with minced beef or lamb. As per shape, Kibbeh can also be shaped into balls or patties, and baked or cooked in broth. This is an Arab method for cooking meats such as chicken, lamb, beef and sometimes goat. The meat is typically placed on a vertical split that slowly turns. Slices of fat and seasoned or marinated meats are layered on the spit and meat slowly cooks through the heat from the center cone throughout the day. Meat shavings are then removed from the top-to-bottom with a large knife or similar tool, and collected in a tray below. For extra flavour, an onion, lemon or tomato maybe added to the top of the skewer. Shawarma can be served on a plate with accompaniments, or as a sandwich or wrap (which is what is commonly done in Nigeria). These are scrumptious, round, golden-brown croquettes that are crispy and crunchy on the outside, and warm and moist on the inside (sounds delicious right?). It is a vegetarian dish that consists of fava beans, chick peas and a special blend of spices. It is typically served with tahini sauce and can be eaten on its own or wrapped up and rolled into a sandwich with pita bread. Mujaddara is an Arabic word for ‘pockmarked’, which is fitting considering the lentils among the rice resemble pockmarks. The dish consists of cooked lentils together with groats, generally rice, and garnished with sauteed onions.